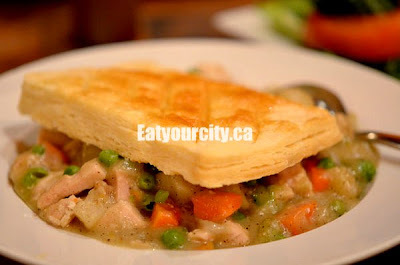 Craving a homecooked style meal and freshly baked treats - choooooocolate! We headed down to Vi's for Pies - no matter when we go, we always seem to miss it and have to loop back. We gawked like little kids at the display case (a tradition I think everyone does when they walk in) loaded with a variety of sinfully decadent cakes, pies and squares before self seating ourselves close to the fireplace. 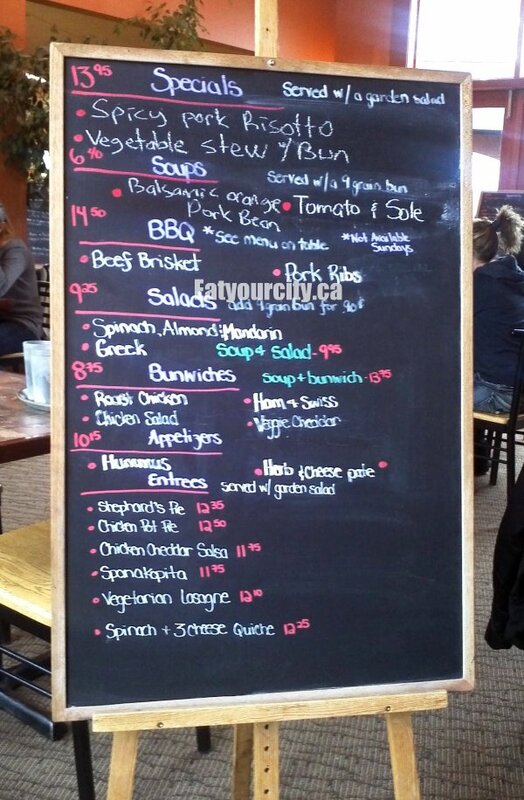 We quickly order food as those desserts are just flying out of the counter like magic! 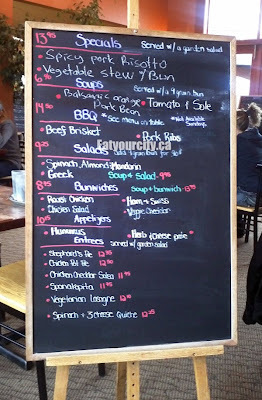 Love the blackboard art easels used as menus. The waitstaff may not like them as much as they have to swing the large things over to every table they serve so customers can read it. We were told by the waitress that the chicken cheddar salsa was a cheddar cheesy chicken cubes and salsa all rolled up in phyllo pastry... chicken, salsa and cheese? Mmmm.. sold! Got a garden salad with a thick sour creme based dill dressing on the side - just in case the salsa turned out to be too spicy. Sadly, didn't see much cheddar cheese... anywhere. Maybe it was the little small white granules inside - Parmesan maybe? 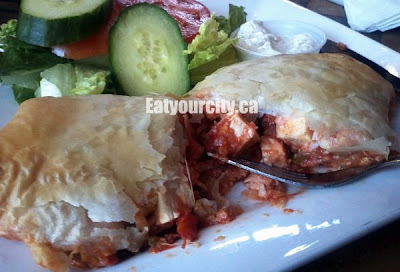 It would have been a lot better with cheese, but it was still tasty in a simple sense - its chicken breast cubes, a mild salsa, wrapped in a crispy phyllo pastry. 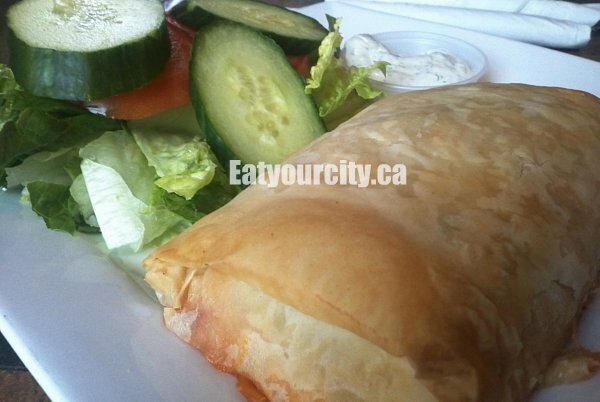 And like any phyllo pastry item - eat it fast before it gets soggy! . Being pretty full despite packing up most of the entrees, we stepped up and shared a dessert. While we tried to narrow down what dessert we wanted (too many desserts, too little tummy room), a few customers ahead of us winnowed down our selections by purchasing a lot of cakes to take home lol! 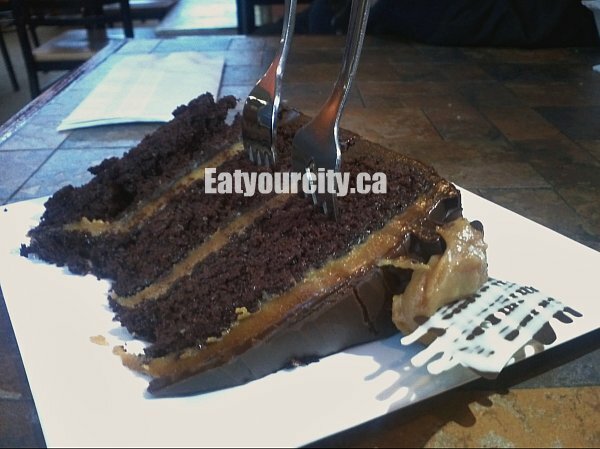 We eventually went with a slice of caramel brownie cake covered with a nice layer of dark chocolate ganache, and a surprisingly soft (not hardened from the cooler) creamy caramel layered between moist chocolate cake. The caramel sauce would be incredible when warm, but still...Mmmmmm! And served with a barely sweetened whipped cream - good choice as it actually helps cut some of the sweetness all the dreamy caramel gives to the cake. And for those that really love caramel, there's a big glob of it topping the cake.. perfect for those who want to leave with a final stick to your teeth sugar rush. Overall, despite not having cheese as advertised in the chicken salsa, the desserts made up for the missed ingredient. 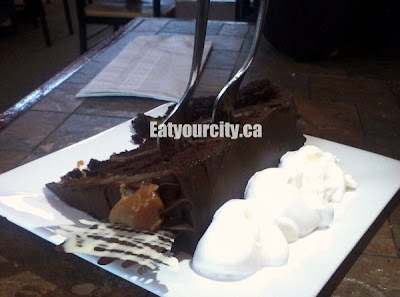 Still my go to place for simple and yummy homestyle fare, and of course... awesome desserts made fresh daily.